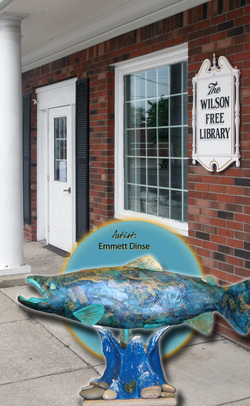 The 24-inch fish owned by Friends of the Wilson Free Library is displayed inside of the library at 265 Young Street in Wilson, New York. The fish followed a blue/green color scheme with copper accents and was designed and painted by eighth grader Emmett Dinse. The first library was organized in Wilson in 1911, at the home of Arthur Dobbs on Pettit Street. He became the town's first librarian, earning $80 per year. At that time, most of the money needed to finance library materials came from the Delphic Circle, which also helped purchase the property on Young Street where the library is now located in 1929. The library houses many archival resources documenting Wilson's history, including The Wilson Star, which dates back to 1890. Today, the Friends of the Wilson Free Library are led by an Executive Council including Michele Platter (president); Jay Tooker (vice-president); Janet Hoffman (treasurer); Michele Cerrone (secretary); Marie Kurtz (membership); Betty Haag (publicity); and Marge Clark (town librarian). The Friends is a volunteer nonprofit organization whose purpose is to provide the material, financial and volunteer services which are needed to enable the library to thrive in the Town and Village of Wilson. The Friends meet on the first Thursday of each month at 7 p.m. in the Library Community Room. All are welcome to attend. The Library phone number is 716-751-6070.For more information about the Wilson Free Library, please visit: www.nioga.org/libraries/wil.html.